When clients arrive at the airport, they will be picked from there and taken to Bayete guest lodge in Victoria falls. Depending on the arrival time at the lodge they will be allowed time to freshen up and prepare for their first activity which will be a cruise on the mighty Zambezi River. The cruise will take two hours at most and clients will be transferred back to the lodge. The cruise will give you a chance to relax while you cruise up the Zambezi river. Guests will be picked from the lodge so that to partake in following activities will be done during the day, walking with the lions in the morning and this will take about 2 hrs, guided tour of the falls, helicopter flight [12-13 minutes] which gives a chance to view the Falls from above, lunch at the Deans café which is located close to gorge of the Victoria Falls. The Boma dinner and drum show. After lunch they is a choice between going to do shopping at the open curio markets or going back to the lodge to rest and prepare for the Boma dinner which is well known for the African dishes and drum beating show as entertainment. Clients are transferred to Hwange national park which is the most visited park with, the biggest number different species of animals in Zimbabwe. Due to the distance from Victoria Falls clients will be transferred by a charter flight to the Somalisa main camp which is located in the Hwange national park. 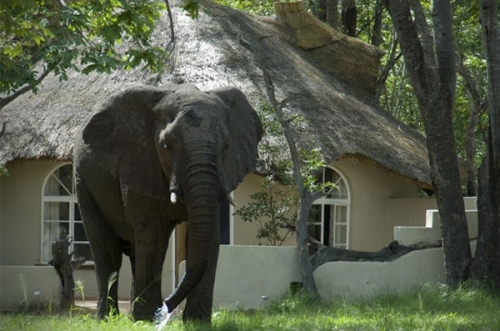 On arrival from the Somalisa Camp Hwange national park, clients will have to check-in at the Batonka guest lodge. It is a luxurious well-appointed place to stay while you wait to make arrangements for the departure flights out of Victoria Falls International Airport. Depending on the time available clients can choose to do additional activities such as elephant interaction, elephant ride, game drive at the Stanley and Livingstone reserve or to go and see the mighty Victoria Falls once more, to utilize the time that will be remaining or alternatively they can opt to do shopping for souvenirs at the open markets in Victoria falls. All the activities on this day will are optional and therefore paid for as extras by the clients who will decide to do so. Accommodation at Batonka guest lodge and all meals are the only things included on the package price. Guided tour of Falls and Entrance Fee $ 60.00 p/p. Guests will check-out at 10am and then taken to the Victoria falls airport on road transfer for their departure flights. They will be assisted to do the check-in, after that they will be left to board the flight.